Today I’m switching gears from cross-continent trips to my further experiments in carbon fiber framebuilding. I’ve spent the second half of this year bumbling my way through the first quarter of graduate school and designing and building my second carbon fiber frame. I did a lot of different things this time, and I’m eager to share what worked and what didn’t. About 90% of my instruction has come from small blogs with blurry pictures, and 50-page forum posts in a variety of languages. So this is my way to spread my breadcrumbs for others who looking to do something like this. It’s been a fun project. Instead of dumping every bit of information in one post, I’m going to split it into two separate ones, each covering one of the two main new production processes I designed to complete this frame. The first will focus on the fiber winder (or faserwickelmaschine), which I designed and coded up late last summer to create some strong, light, visually appealing carbon fiber tubes. The second will focus on the finishing of the frame, and a description of the new webbed lug technique I used to bind all the tubes together. 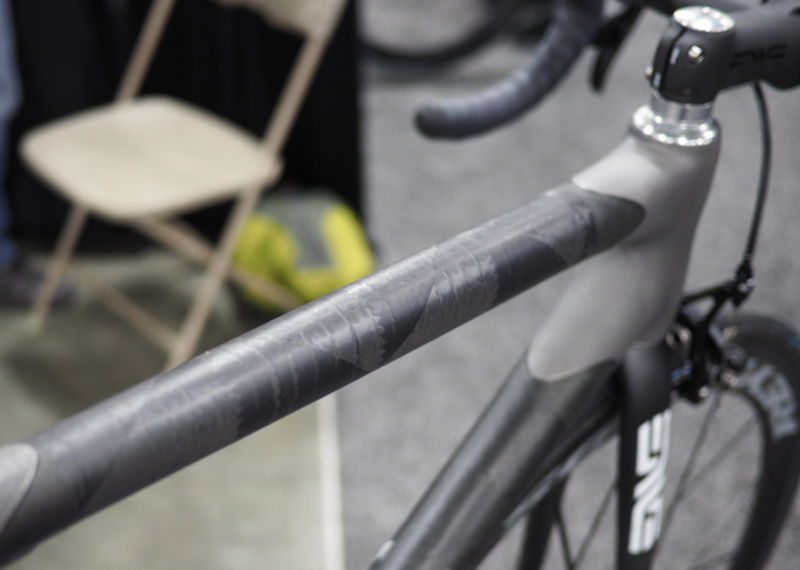 My previous frame’s tubes were made out of unidirectional carbon fiber fabric, wrapped delicately around a mandrel, and then placed into a mould. This was a messy process, and in the hot DC summer the whole try-and-wrap-feet-of-wet-fabric-on-a-mandrel-without-getting-epoxy-on-yourself contortion routine felt like I was doing hot yoga and would leave me sweaty and exhausted after each tube. A fiber winder eliminates this labor-intensive task, and would result in lighter and more visually appealing tubes. A fiber winding machine wraps carbon fiber tow (string) in a pattern around a mandrel, eventually ending up with full coverage and a strong tube, with a cool pattern on the outside. I just thought these frames, made by Metier, looked super cool and wanted to try it myself. Straight fiber wound tubes at Rock West Composites, a major composites manufacturer, sell for about $30/foot and weigh about 100g/foot at the diameter I’m interested in. If I wanted that cool pattern, I was looking at spending about $70/length at a weight of 200+g/length or make my own. So one feverish night in Nukus Uzbekistan, I spent a few hours looking up fiber winders, and how conceivable it would be to do just that. I was exhausted, having ridden my bike hundreds of miles into the middle of the desert and having spent that particular day running around trying to find an Uzbek notary to tell Azerbaijani customs to send me my spare tires. “I can beat $30 and 200g a foot,” I declared. More fiber winding vs. fabric. If there were millions of people who wanted a fiber winder, then the price would drop like 3d printers. However, the number of super small-scale hobbyists who have a need to not just make a tube out of carbon fiber but make it quickly and cheaply and strong enough to bear weight is small. Having found literally every resource on the web for people in my position (there’s like, two or three) I can conclude that there are not hordes of potential fiber winders out there. For my purposes, I just want to make a bike tube. It doesn’t have to be glamorous. I don’t need to make a fuselage. I’m not going into production. Should be simple enough, right? I mean, in this Arduino/aluminum extrusion DIY community, it’s really not. People use dozens of stepper motors at the same time to do various tasks. I only need two motors/axes. One rotating a mandrel and one moving a car with the carbon tow along linear rails. Some spoilers in this pic, but it’s the best one I have of the setup. 1 x three wire green-white-black power cord, from any electronics you have. I used an old laptop cord. Cut off the non-plug end and tin the wires. Connect to power supply. Lots of 2020 Aluminum extrusions, two aluminum rails, linear bearings, PVC attachments, stepper motor gears, stepper motor belt, wires to hook up all the goodies. Various 3D printed parts, designed by me in Fusion 360. Things to attach the motors, rails, gear to the extrusions, etc. I could probably cut down on the cost even further if I made all the joints between extrusions this way. Carbon fiber tow. 5km, 12k spool, I think? It’s big. Early version of the electronics. I have now switched to Big Easy Drivers. I purchased most of these in a big AliExpress order. Each of these parts can be cheaply obtained there, as opposed to Amazon or some other industrial supplier in the US (for aluminum extrusions, mostly. not trying to pay $3 for each 2020-extrusion-specific nut). These parts eventually showed up in LA to await my arrival. When I showed up in late July, I made quick work assembling the machine and… struggling with basic electromagnetism. I needed a quick refresher course on current and voltage. And soldering. Arduino code is basically a simplified C++ environment that allows you to run stepper motor ‘shields’ through the Arduino UNO. After pushing up against a number of unexplained electrical issues (in retrospect, bad solders, low torque (low current. Use Big Easy Drivers, not Easy Drivers. Easy Drivers only provide .75A/phase where the BED can go up to 2A/phase), I returned home for a few weeks to ride around Oregon and stuff, not really sure if this project would really come to fruition. I came back to LA and hit the ground running, with two new shields (the Big Easy Drivers). I took a rare rest day off my bike and committed myself to pushing through. I ate a big breakfast, connected the motors, sent the code, and it worked! That morning, I was making designs on the pvc with a pencil moving back and forth. By noon, I had graduated to party ribbon. That evening, I had my first tube. Winding carbon for the first time. On that note, mandrel prep is super important. You need something that will slide off easily after something as hard as a carbon fiber tube has been clamped on it. I have given myself blisters trying to do this before. My key (not THE key, I’m sure.) is PVC treated with WD-40, then a layer of parchment paper wrapped very tightly over the WD-40. Some spray adhesive and blue painters tape (very useful in 3d printing as well) to keep the parchment paper in place. The WD-40/silicon parchment paper coating combo is a great release agent. I’ve tried mould release before, but that just doesn’t work nearly as well as the WD-40. Also note: If you put the tube in the freezer, the pvc will also shrink a minuscule amount more than the fiber, which will make things even easier. After the mandrel is prepped, mount it on the stepper motor and get to work winding. Commercial winders give you many more options, and you’re welcome to figure out the mathematics behind everything if you need to be exact. I distinctly remember spending a night feverishly working this all out this mathematically in my tent out in Middleoffuckingnowhere, Uzbekistan. But now I look back at the notes and they’re all gibberish. Even so, trial and error might actually be better for settings on this simple of a setup. You can input the right settings, but there’s a lot of difference between what I’ve been inputting and the actual path of the fiber. Find settings that work for you. If you do it right, a certain really cool pattern starts to appear, and you will have very few overlapping parallel strands. As satisfying as it is to reach this point, where the threads line up and the pattern appears…. it’s just as frustrating to be stuck here where the threads aren’t matching up. If you’re having trouble visualizing how this works, or programming it up, just think of the process most simply like this: You have a carriage run lengthwise, a time to wait at the end, and then a carriage return. The simplest way to get this ‘optimal’ pattern is to have the carriage run take place in an exact number of turns of the mandrel, and then have the wait at the end be a certain number of rotations (1-2 is fine) with a few microseconds more so that when the carriage run happens again, it’s doing the same thing but shifted by half a centimeter. This will get you good coverage. If you don’t hit this sweet spot, you’ll end up with grids that are uneven. This may create problems with air bubbles. Weaknesses: I wanted to incorporate an epoxy bath into this design, but I managed to get good results by just dripping epoxy over the top as the winder was going. The bath just ended up not being necessary. Maybe I’ll work on that later. I also can only right now wind on straight tubes at a 90- or 45-degree angle. any 0-degree plies (perpendicular) I’ve done with a layer of unidrectional fabric. That was always the easiest part of the previous tubes anyways because the fabric is easiest to bend perpendicular to the fibers. Are they strong? Yes. All-my-strength rubber mallet tests on the poor spare tube will attest to that. Are they light? Yes, 150g/length. Can I make them cheaply? Yes. $7-8/per length in materials. More to come in part 2, including the frame build. Four raw tubes in. Three of these made up the new frame. Three tubes, 150g/tube, probably $7-8 in materials for each 2.5ft length. Managed to significantly beat my targets.